Exterior and interior shutters plus double-hung windows on this sky-blue wall allow any combination of ventilation, privacy, and protection from storms that are desired. As seen, with outer shutters open, inner ones closed, and the double-hung windows closed, sunshine can stream in on a sunny day, but curious eyes can't. As the day warms up, simply slide down the top window to take in some fresh air, and open the bottom inside shutters for maximum sunlight. 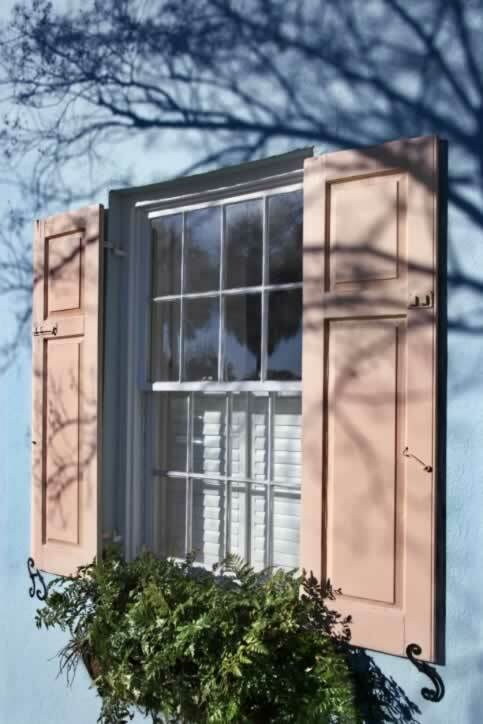 But during an icy cold winter sleet storm, batten the hatches by closing all windows and the inside shutter vanes, and latching those soft apricot shutters that look so rich against the blue wall. Note the pleasing interplay of rectangular shapes between the evenly divided eight-over-eight panes and the one-third, two-thirds exterior shutter pattern. Everything about the window delights the eyes.